Let's take a look at the 2011 schedule, see what's ahead, compare it to historical performances over the past 5 years, and then eyeball some other NFC contenders as well. In the Payton era, the Saints are 19-15 (55.9%) in non-dome games and 34-18 (65.4%) in domed stadiums. Again, I'm counting games from both the regular and post seasons. Considering the architecture of the Saints' offense and the makeup of the roster, it's unsurprising that the Saints fare much better indoors. 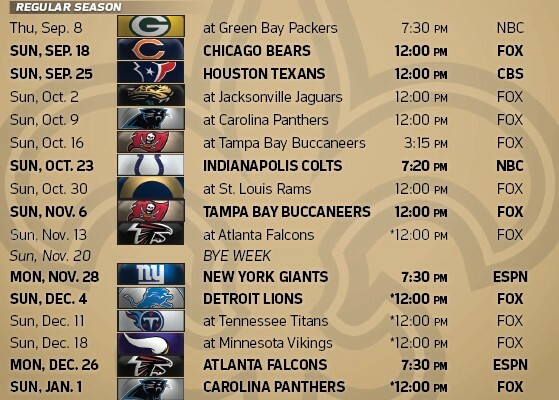 The fact that the Saints play almost 70% of their 2011 schedule indoors bodes well, especially as to how it relates to the final 10 games. Additionally, against AFC opponents in the Payton era, the Saints are 12-9 (57.1%). Against NFC opponents, the Saints are a more favorable 41-24 (63.1%). Presumptively, the Saints fare better vs. NFC competition so the fact that 75% of the schedule is NFC-based is another promising factor. Now let's look at home and away games, and compare those historically as well. The Saints' eight road opponents this year are Green Bay, Jacksonville, Carolina, Tampa Bay, St. Louis, Atlanta, Tennessee, and Minnesota. While it's dangerous and perhaps irresponsible to gauge which games are winnable and which ones are not, we'll go ahead and do it in an indirect fashion. Of the eight games, GB/TB/ATL seem to pose the most difficulty while JAX/CAR seem eminently winnable. The remaining three games against STL/TENN/MINN are less certain to forecast. Over the past five seasons, the Saints are an excellent 26-17 (60.5%) on the road. Based on historical performance and the 2011 road schedule in question, the forecast suggests a road record of 5-3. Conversely, yet almost exactly, the Saints are 27-16 (62.8%) at home since 2006. With Chicago, Houston, Indy, Tampa, the Giants, Detroit, Atlanta, and Carolina on the 2011 Superdome docket, the Saints' home schedule poses a real challenge. One could argue that there's only one "easy" game among the eight (that should be Carolina). Again, if you're gauging future success on past performances--and I'm not arguing that you should--the Saints may be destined to go 5-3 at home. To examine the schedule in greater depth, let's deconstruct the schedule into four quartiles and compare it historically as well. Let's look at how the Saints have fared in each seasonal quartile during the Payton era. What's most glaring is that the Saints have consistently performed their worst in the season's final four regular season games under Payton. Additionally, the Saints have shown a propensity for high performance in the "middle" eight games during this same span with a combined win percentage of 70%. Both of these benchmarks could be attributable to myriad factors and I'd rather not speculate as to what those are. The reality is that, under Payton, the Saints are at their best after they've played a few games and at their worst as the season winds down. ... Q1: @GB, CHI, HOU, @JAX. Reviewing each individual group, it appears that the difficulty of this schedule falls in the 2nd and 3rd quartiles with challenging road games at Tampa, at Atlanta and at an improved St. Louis team. Home challenges include the Colts, the Bucs (who have won three of their last four games in the Superdome), the Giants, and a young Lions team looming as a contender. I'll forecast 5-3 during this stretch which is a bit below historical performance. Circling back to the 1st quartile, I'll forecast a 3-1 mark. 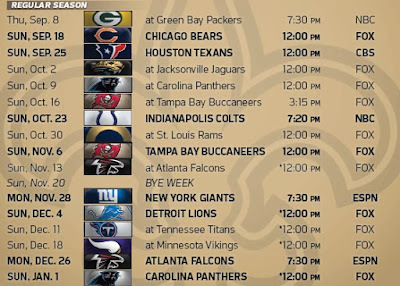 Other than the 0-4 start in 2007, the Saints have generally started off well and I expect a fast start from them in 2011, looking to redeem themselves from a bitter end to the 2010 campaign in Seattle. As for the 4th quartile, I'll forecast a 4-0 mark. One of the greatest attributes that Sean Payton possesses--in my opinion--is the ability to identify weaknesses and design a strategy to remedy them. This has manifested itself during his tenure in the form of, among other things, a desire to improve an inconsistent running game (witnessed in '09 and the '11 offseason); his overhauling of the secondary; his firing of personal friend Gary Gibbs and subsequent hiring of Gregg Williams; and his change of bye week routines. One can be certain Payton is acutely aware of his team's struggles late in the season, and I'm confident "finishing strong" will again be a point of emphasis for the 2011 late-season schedule. So that's a 12-4 prediction for 2011. When you take into consideration historical trends, the talent level on the roster, the expectation of contending for a title, the late season bye week, the potential to face several rookie QB's, and the favorable dome-centric schedule, the Saints are well-positioned for another Super Bowl run. Will 12-4 be good enough for homefield advantage? Let's look at some other presumed NFC contenders and make some guesses. Green Bay: Super Bowl hangover? Or is their massively talented roster impervious to a letdown? A moderately challenging schedule includes games vs NO, @ATL, @CHI, @SD, vs TB, @NYG, and @KC. I'll say 11-5 which would be an improvement over 2010's record. Atlanta: Duplicating a 13-3 record will be monumentally difficult for the Falcons, especially in arguably the toughest division in the league. With an aging, though talented team, 10-6 seems right. Philadelphia: A young, fearless, well-coached team. They have as good a shot as anyone in the NFC as long as Vick stays upright. With a less than challenging schedule, I'll pencil them in for 11-5. Tampa Bay: Sure to be the media darlings in 2011 as the breakthrough team. But are the young Bucs due for a sophomore slump as they develop? Or will a promising draft help them make the leap? With four games vs NO/ATL, a road trip to GB, home dates vs Indy and Dallas, and a west coast trip to SF, I'll say the Bucs finish 9-7. Chicago: I'd be hard-pressed to believe Chicago will repeat its' 2010 success when everything seemed to fall into place for a team with marginal talent and questionable coaching. With what appears to be a fairly difficult schedule, I'll say the Bears finish 7-9. Dallas: I don't know why I'm even including them on this list. What have they done to merit consideration besides being popular? I do, however, think that Jason Garrett will ultimately become a very good head coach. With the defense its major area for concern, the Cowboys schedule looks mostly favorable and their offense will be good enough. I'll forecast a rebound year at 10-6. Detroit: An up-and-coming team with young talent canvassing its' roster. They are sure to be on plenty of 2011 "sleeper" lists but can Stafford stay healthy? Their schedule looks pretty tough. I say 8-8. New York Giants: The Giants quietly had a fantastic draft and will be a tough out in 2011. But the main roadblock is a brutally difficult nine-game stretch to close the season, with a west coast trip thrown in there for good measure. I can't see them surviving the carnage to finish any better than 10-6, which would be commendable. St. Louis: This is another team that will make plenty of "sleeper" lists in 2011. In a weak division with a soon-to-be elite QB and a rapidly improving defense, the Rams are poised to make the leap. But not just yet. The schedule is daunting in the first eight weeks before it levels off. We'll learn a lot about the Rams in the early stages of 2011. 9-7 would be a good mark.